CARACAS, Venezuela (CNN) -- Venezuela temporarily seized a pasta-making plant Friday belonging to U.S.-based food giant Cargill, citing a production quota dispute. Venezuelan President Hugo Chavez's government takes over a Cargill plant for the second time in recent months. Rafael Coronado, Venezuela's deputy minister for food, announced the takeover live on the state-run Venezolana de Television channel. He said the plant did not meet production levels for pasta sold at lower, government-mandated prices. An inspection of the plant Thursday found that 41 percent of its pasta met the government-established level, Coronado said at a news conference in front of the food plant. Fifty-nine percent was "out of regulation," he said. The Venezuelan government will take over the plant for 90 days, he said, and then will determine what steps to take next. It was the second time in recent months that the government of left-wing President Hugo Chavez has taken over a Cargill plant. 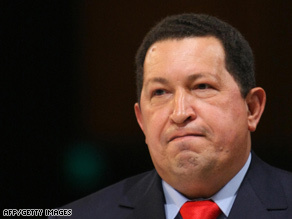 Chavez announced in March that he had ordered the takeover of a Cargill rice plant. Cargill spokesman Mark Klein said Friday afternoon the Minnesota-based company did not have an immediate comment. But Klein said in March, when the rice plant was taken over, that Cargill "is committed to the production of food in Venezuela that complies with all laws and regulations." Chavez: Smiles, handshakes don't change view of U.S.
Cargill has been doing business in Venezuela since 1986, according to the company's Web site. Its operations include oilseed processing, grain and oilseed trading, animal feed, salt, and financial and risk management. The company has 2,000 employees in 22 locations in Venezuela, the Web site says. All About Venezuela • Hugo Chavez • Cargill Inc.